This article first appeared online as a guest post for The Christian Science Monitor blog Modern Parenthood on Friday, June 28, 2013. Siblings fight. It’s part of how kids learn to resolve conflict. Parents expect it, shrug it off, and tell their kids that, one day, they will be best friends. Study authors indicated that victimization among siblings could be just as harmful as peer bullying. 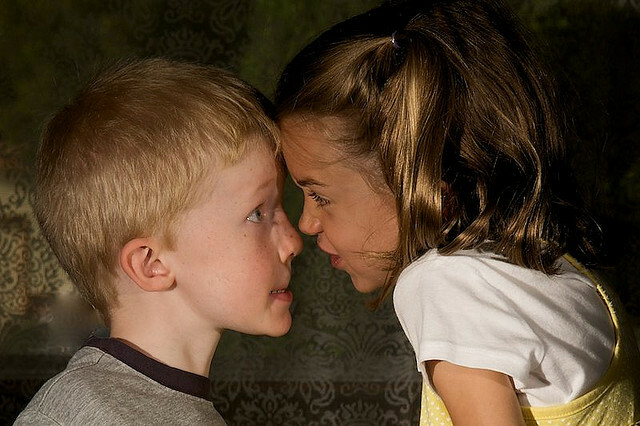 This is startling news for parents, who see the sibling dynamic as the ideal relationship for practicing independent conflict resolution. How can parents set the stage for this kind of learning without opening the door for one sibling to victimize the other? Parents should start while the kids are young, suggests Lauren Bondy, a licensed social worker and founder of Parenting Perspectives, an Illinois consulting agency offering workshops, courses, and counseling services to families. “Parents can do a lot of things when kids are younger than four to teach them the skills to work conflict out on their own,” Ms. Bondy says. Young children need to be taught about the effects of their behavior in firm but kind ways, she says. She cautions parents to avoid making young children feel bad about their actions because they are still learning how to deal with their own emotions and how to interpret others’ feelings. As children grow older, parents can talk with kids during calm, neutral moments about ways to resolve conflicts, including walking away, ignoring unwanted behavior, and establishing a compromise. Once kids have these tools, parents should allow them to freely explore them, because jumping into conflicts and resolving them for kids can actually promote a bully-victim dynamic, Bondy says. “Frequently parents jump in with their own perception of who is right or wrong and lecture and punish them. They often expect more from the older child and feel they need to rescue the other one. In actuality, this is setting up a victim mentality; the older child feels bad about who he is and the younger child ends up feeling incapable,” Bondy says. Parents do need to intervene if a child loses control and begins to hysterically kick, scream, and throw things, she says. In that state, she says kids are not capable of hearing anything. The only thing to do is remove the child somewhere she cannot harm herself or anyone else and let her calm down. Teaching kids self-calming strategies can facilitate this process. Parents also need to be on the lookout for intentional, repeated victimization between siblings, Bondy says. While conflict is developmentally appropriate, an imbalance of power in the relationship can be harmful. “Aggression between siblings, especially younger ones, is normal, but some measure of it, particularly if there is an element of fear and intimidation or harassment, becomes really worrisome,” Dr. Davis says. Parents should pay close attention to signs that one child is feeling frightened or intimidated, Davis says. “I think the main clues about bullying are anxiety and regression in functioning of the kid who is the victim,” he said. While Davis cautions against taking sides in sibling conflict, he encourages parents to focus their attention on supporting the victim rather than punishing the bully. “If you focus on responding to the aggressor you reinforce the aggression. That might have even been part of the motivation for the aggression,” he said. Parents should also be aware that a child who brings bullying into the home, might be experiencing bullying somewhere else or might need help dealing with stress, Davis says. Parents don’t have to have all of the answers. Parenting programs and counseling can be a useful forum for parents to explore ways to support their children. This article was first published in print and online by Spare Change News on September 21, 2012. “Who wants to read a poem?” Saul Williams asked the audience. The crowd gathered at the Brighton Music Hall in Allston, Mass., was small, just a couple hundred people, but it appeared to be made up of devout fans. Many people clutched dog-eared copies of Williams’ books of poetry to their chests. The audience froze for the smallest fraction of a second; was that a rhetorical question? Suddenly, a man sprung three feet into the air from the front row, like the first popcorn kernel to break free from its casing, and landed in a squat on the stage. Quickly, as if Williams might withdraw the offer, more poets joined him; six at first, then more as a dozen or so young people popped onto the stage. 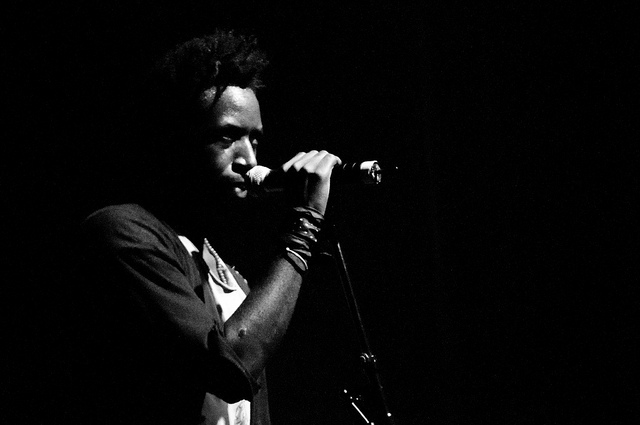 Saul Stacey Williams was born in 1972 when his mother was rushed to the hospital from a James Brown concert in upstate New York, as he tells it in his song “Elohim 1972.” The singer, musician, poet, and actor is known for esoteric rhymes, sharp social criticism, and deeply resonant voice. This was his second performance at Brighton Music Hall this year. This past winter, he came accompanied by a band to promote his album, Volcanic Sunlight. This time around, he came without instruments or entourage. Backstage, after the show, Williams discussed his motivations for the book. “I encounter so much amazing talent and so many well intentioned voices who don’t have the avenue of expression or the doors open to them that have been open for me.” He added that Chorus represented a chance to hold the door open behind him, however briefly. He felt that inviting members of the audience to recite their poetry during his shows was the next logical step. The crowd at Brighton Music Hall literally jumped on his offer. As each poet recited a poem either from memory, a slip of wadded up paper, or a smart phone notepad, Williams listened thoughtfully, sitting on the floor the stage, his long arms draped around equally lanky legs. Most of the poets never mentioned their names, simply content to add their voices to the chorus. One young man, who did not have any of his own poetry ready, read from one of Williams’ books, just so he could share the stage with his idol. Williams does not wear words like idol comfortably. His first taste of fame came in 1998, after the release of the independent film Slam, produced by Trimark Pictures. He co-starred with Sonja Sohn, Bonz Malone and Lawrence Wilson. He played an incarcerated rapper that latched onto poetry as a means to reflect on the culture of violence in the housing project where he grew up in Washington DC. The film won a Grand Jury Prize for Drama at the Sundance Film Festival and the Camera d’Or at the Cannes Film Festival. Williams soon developed a cult following among slam poets and a relatively obscure segment of the hip-hop community looking to counter the “gangsta rap” scene that had dominated the ‘80s and ‘90s. After spending five years regularly participating in poetry slams, he said that, after the release of Slam, his presence became disruptive. “Suddenly people would change the poem they were going to read because they wanted to read something that I had inspired.” What’s more, he began to hear his own influence in the work of others, which he found surreal and bizarre. He withdrew from the slam scene and focused on his music. Since, he has tried to find other ways to engage young poets and break that invisible fourth wall separating the artist from his audience. During spoken word shows, he frequently calls for houselights and opens the floor up for discussion in an effort to “break the mold of celebrity.” However, he feels that his fans continue to push him back onto a pedestal, expecting him to have the answers to the social ailments, such as racism, misogyny, and religious strife that he explores in his poetry and lyrics. When a woman in the audience at the Brighton Music Hall asked him if the nation was ready for a post-race society, he blurted out. “No. I think America is obsessed with race.” He tried to go on, stammering for a moment before throwing up his hands. “Look, I really don’t have the answers. I just have the frustration, and the poems to prove it.” In the greenroom before the show, Williams vented some of that frustration with what he sees as an American fixation on race to a half dozen fellow poets, friends, and fans over a pre-show beer and pizza. As he talked about moving to Paris with his girlfriend and two children, a friend asked him if he had connected with African-American expatriate community. He laughed, “I didn’t move to Paris to join a gang,” he said. He added that while Parisians are by no means color blind, they do not seem to have the same need to transpose it onto every discussion. However, he said that when his American friends come to visit, the conversation inevitably turns to race. “At first, my girlfriend and I thought it was the couch,” he joked. Several times before, during, and after the show, Williams returned to the idea that enforcement of free labor and control of women lie at the root of not just racial tension, but many of the world’s inequalities. Much of his work highlights the concept of the feminine, which he believes has been demonized by social convention, religion, and culture. As a child, he said he openly challenged his prominent Baptist preacher father’s cronies’ refusal to allow a woman to preach from their pulpits. What Williams saw as the subjugation of women in the church became a recurring discussion between him and Rev. Saul S. Williams. Williams opened up that discussion publicly in his debut hip-hop album, Amethyst Rock Star, released in 2001 by American Recordings. In the album’s final track, Williams lay down a recording of his father’s sermon. Back in the greenroom, he recalled attending his father’s church one Father’s day when the minister gave a sermon on the importance of the father. “For me, it was ironic because the church was always filled with women and children.” Williams said he stole the recording of that sermon from his father’s office and added a subtle beat around it. At the end of the minister’s sermon, Williams calmly stepped in with his own response. The beat swelled to a crescendo as Williams chanted the chorus in a throbbing monotone. When asked if this was a source of tension between him and his father, Williams replied that the minister had called it beautiful. “I caught him listening to it more than once,” he said with a smile. While his father believed strongly in his convictions and his calling to be a minister, he said that the minister always encouraged rigorous discussion. Williams describes his upbringing as culturally middle class. “We didn’t have a lot of money, but we had a lot of books; and we had a lot of discussion.” He recalled challenging his father’s beliefs right up through his eulogy at his funeral. Williams continued those discussions throughout his life, by participating on the speech team as a child, studying philosophy as an undergraduate student at Morehouse College, a predominantly black, men’s school in Atlanta, and for the past decade, he has shared his thoughts and opinions with his fans through spoken word and music. With Chorus, he reminds his fans that his voice does not stand alone. He has used the book and the accompanying tour to encourage his fans to take part in the discussion, and strike up the chorus. NORTH ADAMS, MASS. — In 1984, the U.S. Supreme Court’s first woman justice, Sandra Day O’Connor, was still a newbie. Astronaut Sally Ride had just become the first woman in space. And Gail “The Champ” Grandchamp wanted into the Olympic boxing ring. She wanted it with all the ferocious energy that coursed through her fists. That year Grandchamp (yes, her real name) took on the all-male boxing establishment and delivered the legal KO that opened the door to this summer’s first-ever women’s Olympic boxing competition. This August, two of the three women on the American boxing earned medals. Flyweight Marlen Esparza brought home the bronze, and middleweight Claressa Shields won the gold. Neither of them would have made it to the London games if it weren’t for the little-known welterweight from North Adams, Mass., whose tenacity in the ring was matched by her determination to wage an eight-year gender-discrimination battle for her sport. At the time, Grandchamp says that no one expected her to succeed in court. Five attorneys dropped her case, sure that she would never win, but she persevered—even after she knew she could never benefit from the outcome herself. “They thought I would just go away, but I am a strong African American woman and I intended to fight for my rights,” roars Grandchamp from behind a tiny desk tucked by the window of her personal training studio in a rundown strip of storefronts in this western Massachusetts town. Not only was Grandchamp deprived of her chance to go for the gold, she never even got credit for her historic battle to open the door to other female amateur boxers. But in the style of a true champion, she refused to wallow in defeat. Instead, she drew on her childhood experiences with gangs and crime to become an inspiration to troubled youth in her community. Today Grandchamp is gaining recognition by her community for her work in the two arenas of her life. “She is such a force for girls to look up to,” said Gianna Allentuck, who invited Grandchamp to mentor young at-risk youth in her Springfield, Mass., boxing program, The Officials Club. Allentuck adds she inspires boys as well. As a teen Grandchamp fell in with a gang, carried a switchblade, and committed thefts. She had many run-ins with the police and accumulated a lengthy juvenile record. While she was serving probation for stealing bicycles, clerks at a downtown department store caught her stealing a clock. “My probation officer told my mother to pack my bags,” she recalls. Expecting to be sent away to a juvenile detention center, she begged the judge for one last chance. The judge granted her wish, and Grandchamp changed her ways. She started paying attention in school and reading the Bible. She started playing softball and weightlifting. She says that it was through organized sports that she learned about self-discipline and how to be accountable for her actions. People who know Grandchamp’s story are moved by her selfless determination. Last spring the Massachusetts legislature recognized Grandchamp for her “dedication, devotion, and achievements in leading the fight for women and women’s boxing,” as part of a celebration of women’s history in sports. Grandchamp is still waiting to get this kind of recognition from the boxing world. The woman who generally gets the credit as the women’s boxing trailblazer is Dallas Malloy, a blonde light welterweight from Bellingham, Wash., who, armed with attorneys from the American Civil Liberties Union and Grandchamp’s crucial precedent, challenged USA Boxing’s bylaws in federal court. The judge approved an injunction within moments of hearing the case, and in 1993, at age 16, Malloy became the first woman to fight in a USA Boxing sanctioned event. Grandchamp says that Malloy, who retired from amateur boxing after just nine months, has yet to publicly acknowledge that Grandchamp laid the groundwork for her historic fight. Grandchamp described her historic journey in an interview at Grandchamp Fitness and Boxing, a personal training facility in North Adams that Grandchamp founded. The battle began in 1984, when her coach tried to register the 29-year-old with the New England Amateur Boxing Federation, a regional arm of the governing body now known as USA Boxing. The coach received a phone call from a puzzled federation official asking if Gail Grandchamp was a girl. Yes, he said, and one of his best boxers. The official replied that no female could register as an amateur boxer. “He told him, ‘Don’t even bring her down here. There’s no such thing as amateur boxing for women,’ ” Gail recalls. Devastated, Grandchamp vowed to knock some heads together, figuratively, and change their minds. In January 1985, she filed a complaint with the Massachusetts Commission on Discrimination against both the regional and national federations. Feeling that the commission was not taking her complaint seriously, Grandchamp hired an attorney and filed a lawsuit against the New England Amateur Boxing Federation. By the time she had her day in court, five attorneys had come and gone, including a lawyer from the National Organization for Women who resigned after deciding the case was unwinnable. Grandchamp watched the birthdays go by as her lawsuit lumbered through the courts, until the hard realization dawned that the battle was not for her, it was for younger women who would follow. As the age limit for amateur boxing—36—slipped by, she gave up her personal dream of amateur boxing and reaching the Olympics. She registered as a professional boxer; but she continued to fight in court. Without any formal legal training, Grandchamp decided to represent herself and carry the case forward on her own. On April 26, 1992, the Berkshire County Superior Court ruled that the New England Amateur Boxing Federation’s ban on women’s boxing was discriminatory and illegal. In the years that followed, Grandchamp refocused her energy on her community in North Adams, a small town in the northwest corner of Massachusetts where roughly one fifth of the population lives below the poverty line. She established the Fighter with Heart Foundation to help members of her community facing financial hardships. She markets a variety of products with her name and logo on eBay to fund the foundation and offer loans and grants to her neighbors needing help paying their utility bills, veterinary bills, and just making ends meet. Twenty years after her victory, Grandchamp boarded a plane for Spokane, Wash., to witness the first-ever women’s Olympic boxing trials. That trip triggered mixed emotions. On the other hand, those women were realizing the dream that she was denied. Everything she had ever worked for had finally come true, but she was relegated to the sidelines. Even more shocking was the realization that the 24 women competing for slots on the first-ever U.S. boxing team had no idea who she was or how hard she had fought for them to be there. “Most of them don’t even know that there was a time that women couldn’t box as amateurs at all,” Grandchamp said sadly. Twenty-eight-year-old Olympic hopeful Tiffany Hearn of San Diego had participated in recent petition drives to bring women’s boxing to the Olympic games, but had no idea who had started that fight, or that it had begun when she was just an infant. “I hate to admit that,” she said. Hearn explained that after meeting Grandchamp at the Olympic trails in Spokane, she and the other girls started asking the older coaches about her and started to piece together her story. Another Olympic contender, Traversha Norwood of Atlanta, said that although she had talked with Grandchamp, she did not learn about Grandchamp’s role in the history of women’s amateur boxing until after the trials. The world watched on as three American women competed for Olympic gold, but few knew that the arduous journey to the Olympic arena began before those women were born. Grandchamp watched the historic bouts on television at home, cheering on the sidelines once again. This article first was published by Spare Change News on July 27, 2012. No sooner had the bell rung than Jamie Jacobsen’s fist connected with my nose. Instantly, my eyes welled up with water and a cold chill set in all over my body. By the second round, my nose had swelled up beyond utility, leaving me struggling to learn how to breathe through my mouthpiece. I staggered through three rounds, eating more punches than I care to remember and wondering what had happened to my two years of training. I bought an ice pop on my way home to soothe my throbbing bottom lip. Clinging to the bit of pride gained from seeing Jacobsen checking out her lip in the mirror after our sparring session, I vowed to myself that I would be back. That was the first time I climbed into an official ring. More than a year later, Jacobsen and I faced off again, but more on that later. Jacobsen and I are among a growing number of women who have turned to boxing for exercise and a competitive outlet. Next month, female boxers will contend for Olympic gold medals for the first time ever, at the 2012 summer games in London. Team USA fighters—22-year-old flyweight Marlen Esparza, 27-year-old Quanitta “Queen” Underwood and 17-year-old middleweight Clarissa Shields—will compete in each of the three women’s events. The road to the Olympics has been paved with lawsuits and controversy even though women have boxed for more than a century. Women participated in a demonstration bout in the 1904 Olympics in St. Louis, the first modern-day Olympics to include men’s boxing events. It would be another 70 years before women’s boxing took the national stage again. In the 1970s, Cathy “Cat” Davis became synonymous with women’s boxing. Major networks televised many of her fights, and in 1978 she became the first and only woman to appear on the cover of The Ring magazine. Her career ended after a formal investigation revealed that many of her fights had been fixed. Through the 1980s the United States Amateur Boxing Federation, now known as USA Boxing, banned women from participating in sanctioned amateur fights until fighters Gail Grandchamp of Massachusetts and Dallas Malloy of Seattle sued for gender discrimination in the late ‘80s and early ‘90s. The ‘90s brought Laila Ali and Jackie Frazier-Lyde, daughters of former heavyweight champions Muhammed Ali and Joe Frazier into the ring and American living rooms. Both went on to win world championship fights. Women’s boxing has grown in popularity ever since, but has continued to meet opposition within the boxing world. John Hazard, former coach of the U.S women’s national team, remembers taking his team to compete in Augusta, Georgia several years ago. He says he arranged for his team to work out at a local boxing gym while they were in town to prepare for the competition. When he showed up, the staff at the gym immediately stopped them. Hazard explained that he had called ahead and had been told that his team could train there, but he was quickly interrupted. “ ‘Whoa, whoa, whoa, whoa! I was told a boxing team was coming. Nobody said anything about any women!’ ” Hazard remembers him saying while pointing to a sign barring women from the gym. Today, Hazard and the coaches at his gym in Boston, The Ring Boxing Club, continue to work with female fighters, whether they are looking to compete, spar for fun or just get in shape. Vogue magazine just listed The Ring as one of the top five gyms in the country in which to learn to be an Olympic boxer. Women make up 40 percent of the membership. Many are students from down the street at Boston University; others are doctors, nurses, scientists, teachers, professors, mothers, and, yes, writers. Jacobsen and I met at Hazard’s club a few days before she bested me in that sparring session. I had trained for two years with boxing coach Teanna Babcock at a local women’s health club chain. Babcock took me under her wing and pushed me to test my limits physically. Soon I had shed 30 pounds and a lot of uncertainty. For the first time, I felt confident, strong, and ready for more competition. That was how I first found myself on the receiving end of Jacobsen’s jab … and her right cross … and her left hook. The Lexington native then headed to Chicago for a year, where she joined an amateur boxing team and started training seriously to compete. A typical training day leading up to a fight included 10 minutes on a stationary bicycle, 30 to 45 minutes of running, a strenuous ab workout, and either circuit training or sparring with her team. Her training ultimately paid off. She fought and won three sanctioned fights, including the Chicago Golden Gloves Championship. This summer, she returned to Boston to be near her friends and family for a few months before moving to San Diego for school. I met up with her at a coffee shop in Allston on a muggy evening in July to talk about her experience as a female fighter. Not everyone understands her love of the sport, however. Jacobsen has never been injured while boxing, though it is by definition a dangerous sport. (I once broke a rib while sparring shortly before an exhibition fight.) In amateur boxing, fighters wear protective headgear and a mouthpiece. Black eyes and broken noses are rare compared to the norm in professional boxing. Still, as with any sport in which participants sustain blows to the head, there is a risk of concussion. My fear of concussions has kept me from pursuing my own sanctioned fights, at least for now. While amateur fighters are taught to fight for points rather than for a knockout, some women are heavy hitters. Jacobsen is one of those fighters. She says she has almost no defensive skills and instead relies on her long reach, her relentless jab, and a mean right cross. I became reacquainted with that right hand a few days later as she and I once again climbed into the ring together. “Move your head, Noelle!” called one of the coaches from the other side of the gym. I have heard that more times than I can count. I tend to rush in head on, catching jabs with my face. Her reach is so long that even when I managed to block her jab my follow-up right cross fell inches short. Though we are comparable in weight, at 5’9” she towers five full inches above me. But Jacobsen responded like no one else had. Unfazed by the barrage of shots digging into her abdomen, she fired soft and quick uppercuts at my gloves. I hesitated a split second, and she pounced. Jacobsen drove herself out of the corner, firing jab, cross, jab, cross, jab, cross and quickly made her way back into the power circle at the center of the ring. Blocking what punches I could, eating those I could not, I fought back as best I could. Red-faced and pouring sweat, we locked eyes through our gloves and grinned at each other. “I forgot how much fun this is,” she said before diving back into the fray. Even with Jacobsen fighting at 60 percent strength (I had made her promise before the fight not to kill me), she easily dominated both rounds. She is a decade younger, five inches taller, and infinitely more disciplined. NOELLE “PIRANHA” SWAN is a writer and editor for Spare Change News. This article first was published online and in print by Spare Change News on June 29, 2012. Bourgeois told the Massachusetts Commission on Gay, Lesbian, Bisexual, and Transgender Youth that his son survived high school, thrived in college, and is preparing to work on humanitarian issues in the Dominican Republic. However, he said that should not let the school system off the hook. Calling Governor Deval Patrick’s 2010 anti-bullying law a step in the right direction, Bourgeois added that as a school administrator he knows that school systems are often overwhelmed with the number of trainings they are required to offer teachers. Without a strong message from the state emphasizing anti-bullying training for teachers as a priority, he worries that such trainings might be poorly attended or fall by the wayside. Despite increased media attention and public education campaigns aimed at reducing bullying, a recent survey of high school students confirms that in Massachusetts, gay, lesbian, and bisexual teens (transgender was not included in the survey) continue to face many dangerous hurdles. Gay students are still three times more likely to attempt suicide than their heterosexual peers. Nearly 10 percent of gay students reported having skipped school during the previous month due to feeling unsafe on the way to or at school. Twice as many gay students reported being bullied and being threatened with a weapon as their peers. These results may come as a surprise to many in Massachusetts, which has a national reputation for being gay-friendly. Several openly gay politicians have been elected public office at the local, state, and federal level. In 2004, the Massachusetts legislature was the first to legalize gay marriage. Governor Deval Patrick even marched in this year’s gay pride parade in Boston. In 1992, Republican Governor William F. Weld first formed the Governor’s Commission on Gay and Lesbian Youth, the first of its kind in the nation, to address the health and well being of gay and lesbian youth in Massachusetts. When Governor Mitt Romney (R) dissolved the Governor’s commission in 2006, the legislature continued it by legislative enactment. In June, the commission held its first public hearings in two decades at the State House and Holyoke Community College. State Representative Elizabeth A. Malia (D-Boston), chair of the Joint Committee on Mental Health and Substance Abuse and the first openly gay state representative in Massachusetts in 20 years, told the commission at the State House that she is proud to be from the state with the first commission devoted to GLBT youth. However, she added that she is alarmed and embarrassed that suicide rates among GLBT youth have not gone down since the formation of the commission. Several dozen students, parents, teachers, advocates, and politicians testified before the commission about cracks in the school system. Starry Neptune Shihuin testified that she had to transfer high schools three times because students bullied her for being different. “I internalized everything. I didn’t tell my family or my friends what was going on.” She said that the weight of her struggles drove her to consider suicide. At her third high school in Charlestown, she says she attempted to start a Gay Straight Alliance at the school but soon abandoned the club due to low participation and harassment from other students. She said her only support came from her art teacher, the only openly gay teacher in the school. While Massachusetts schools are more supportive of gay teachers than they are in some states, it can be difficult for them to be openly gay in front of the students, said Jonathan Nardi-Williams, a middle school guidance counselor. Nardi-Williams suggested that integrating GLBT people and issues into all areas of the curriculum would go a long way in creating a comfortable and safe environment for gay students and teachers, a request that was echoed by several other speakers. “Public high school curriculum must include GLBT issues,” said Brandon Sides, an openly gay football player who graduated from Acton-Boxboro High School this June. He and several other speakers suggested that a gay literature should be included in English curriculum and gay rights explored in history class. “GLBT students aren’t necessarily involved in the GSA or may not have gay teachers, but they all have to go to English class,” said Sides. Nardi-Williams said that he believes that integrating GLBT issues into core classes such as science, English, and history would demonstrate to all students what it means to be a GLBT person, simultaneously helping to normalize GLBT culture and providing role models for GLBT youth. The commission will consider the testimony when forming recommendations for state policies, programs, and resources. Will Aurora Grace New England Sky? This article first appeared in New England Post on January 24, 2012. Eyes turn to the sky as scientists and citizens alike hope radiation from a solar flare on Monday morning brings a rare view of the northern lights. The surprise flash of solar activity launched energetic particles through space at near light speeds. Those particles lit up the sky over the U.K. last night and continued to bathe much of the globe today as astrophysicists warned of possible satellite disruptions. While much of this solar storm is passing over during the day, a small chance remains that New Englanders might also get a glimpse of the spectacular aurora borealis, usually seen only in northern latitudes, says Nathan Schwadron, space plasma physics professor at University of New Hampshire. Schwadron watched the solar flare from his laptop via UNH’s Cosmic Ray Telescope for the Effects of Radiation. “We were sort of watching this happen late into the night and into the morning. We had a flare that went off that was the largest flare we’ve seen so far this solar cycle.” Schwadron said that the size of the flare sent him frantically comparing the event unfolding on his monitor with some of the largest events observed in the past in hopes of predicting what might happen after the flare. He compared the event to one in 2003, the so-called “Halloween storms” that began with a flare very similar to this one but continued as 8 or 9 more flares came three days later. Even without further activity, this flare could potentially result in some damage to hardware. When a shock wave of particles sweeps around the earth, it can interfere with satellites. Snow, as seen with poor television reception, can cloud imaging satellite output. Communication satellites can also be disrupted, particularly near the poles. In the past, geomagnetic storms have caused disruptions in global satellite positioning systems, cell phones, and power grids. In some cases air traffic control has had to reroute flights scheduled to fly over the poles. This time around at least, it appears that disruption to daily lives remains minimal driving attention to the more spectacular effect of the solar storm—aurora borealis. For the northern lights to appear outside of their usual realm, a number of factors must align perfectly, including orientation of the earth’s magnetic field and configuration of the shock wave engulfing the Earth, making it difficult for scientists to predict where they will appear. Due to the timing of this particular event, Schwadron expects that the southern hemisphere will most likely get the best view of the light show. He expects that much of shock will have already passed over New England before nightfall, but urges residents to take a peek up at the night sky, just in case. This article first was published by New England Post on November 29, 2011 under the headline Speedy Neutrinos Shine New Light on Einstein’s Theories; What do Harvard Scientists Say. Throughout the world, physicists are peeking out from their customary obscurity in a hasty scramble to explain recent challenges to Einstein’s theory of special relativity. The scientists are reacting to a second round of experiments at CERN, the European Organization for Nuclear Research, that measured infinitesimal particles called neutrinos traveling at speeds faster than light. Initial findings in September stunned the scientific world and met skepticism, even among the CERN researchers themselves. So they repeated the experiment, shooting neutrinos through nearly 500 miles of rock between Geneva, Switzerland and central Italy, to check the accuracy of their work. Many physicists have bristled at the claim by members of CERN’s OPERA experiment, which calls into question one of the basic tenets of modern physics. Others have set new eyes on interpretations of relativity, searching for flexibility that could accommodate these speedy particles. It takes light one nanosecond, or a billionth of a second, to travel one foot. Calculations that incorporate fractions of a blink of an eye over hundreds of miles traveled require extremely precise measurements. Barr works with the only two facilities in the world capable of checking the timing sequence. The Fermi National Accelerator Laboratory (Fermilab) in Chicago can send neutrinos to the MINOS detector 450 miles away in northern Minnesota. Japan’s T2K experiment sends neutrinos from Tokai to Kamioka, Japan, about 175 miles away. The OPERA, MINOS, and T2K experiments were designed to observe the bizarre tendency of neutrinos to alter their state, not to measure speeds faster than light. Scientists working on these projects have not thoroughly examined their previous data with that possibility in mind. Physicists at MINOS also are analyzing their previously collected data. Fermilab physicist Alec Habig said that an experiment in 2007 hinted at similar results but the researchers doubted their findings, citing probable equipment shortcomings. The experiment’s intent was to determine the mass of neutrinos. While their speed factored into calculations, researchers designed the experiment under the assumption that they would travel slower than light. Likewise, scientists at Fermilab are refining data collected in 2007 and preparing to run their own experiment to test CERN’s claim. While Feldman and Barr both believe that OPERA’s readings will be proven wrong, others are willing to entertain the possibility of an exception to Einstein’s theory. At BU, Cohen and Nobel Prize-winning physicist Sheldon Glashow have been contemplating ways to expand the theory of relativity to accommodate faster-than-light neutrinos. Theoretical physicists have attempted to simply stretch the theory of relativity to allow for particles that move a tiny bit faster than light. Cohen and Glashow have published a paper highlighting a contradiction in this accommodation. According to Cohen and Glashow, if the neutrinos actually travelled faster than the speed of light, they should have lost energy on the way and not reached their final destination. Researchers working on another project known as ICARUS at Gran Sasso National Laboratory, confirmed that the neutrinos observed by OPERA did not lose energy in the way predicted by Cohen and Glashow. This article first was published by New England Post on November 16, 2011. Imagine a soldier deep in enemy territory at the foot of a hill. The objective of his mission lies on the other side of that hill, but so might enemy forces. Or consider a fire chief coordinating containment of a forest fire. He needs information about what is happening inside the blaze, but sending in firefighters would put much-needed personnel at risk. What if that soldier and that fire chief could send in a small, lightweight helicopter to scope out the scene without risking any human life? Turns out, there is an app for that. Researchers at Massachusetts Institute of Technology have been working in conjunction with Boeing for the last two years to cultivate an iPhone application to remotely control “micro aerial vehicles”—or small-scale helicopters, about 20-inches long with 8-inch rotor diameter. In the last year the program application has undergone several successful trials testing its ability to function in a real-world outdoor environment, the capability of remotely controlling vehicles over long distances, and the accessibility of the controls to an unskilled operator. This simplicity means that soldiers would not have to wait for skilled personnel or remote intelligence to alert them to what awaits on the other side of that hill. A fire chief could efficiently delegate his firefighters however he needed and select anyone to operate the helicopter while he continued to coordinate firefighting efforts. Just how far can this technology take us? Boutros said that he is not aware of any Boeing-sponsored projects that would bring this technology to full-sized aircraft. She explained more external factors must be accounted for on the road than in the air. Pedestrians cross the street when they are not supposed to, weather changes the way the vehicle interacts with the road, and construction alters routes that must be navigated. Ground vehicles must be able to react to these changes very quickly. In the sky, adjustments are much more subtle and reaction times are more forgiving. It looks like for now, the sky is the limit. This article was first published by New England Post on October 24, 2011. Italian and Swiss scientists recently observed particles moving faster than the speed of light, which is a phenomenon that violates Albert Einstein’s special theory of relativity. However, Harvard physics professor Gary Feldman is not yet ready to give up on Einstein. It’s now up to Feldman to find out whether the fundamental law of physics—that nothing moves faster than the speed of light—is wrong. “The findings are likely wrong,” Feldman told a dozen members of the New England Science Writers Association last week in a classroom at Harvard University’s Jefferson Laboratory. Feldman works on one of two projects in the world capable of checking these measurements. Fermilab’s MINOS experiment is equipped to analyze a neutrino beam about 500 miles between laboratories in Illinois and Minnesota. This is almost the exact distance between CERN’s Swiss laboratory and the Gran Sasso Laboratory in Italy, making it an ideal location to replicate the experiment. Japan has a third neutrino beam that is about half the length of the MINOS and CERN experiments. MINOS collaborators at the University of North Carolina had tried to secure funding for similar experiments from the Department of Energy previously but were turned down, said Feldman. CERN’s findings violate the laws of relativity and nearly every theory for the past century hinges on Einstein’s assumptions. This claim that relativity has been discounted has reanimated interest in the MINOS Experiment and Feldman expects funding to follow. Einstein’s theory of special relativity states that the speed of light is constant regardless of observer and inertial frame—think back to middle school math problems with balls rolling at two miles an hour down the aisle of a train that is moving at 60 miles per hour. This has been widely tested and universally accepted. Feldman said that we see proofs of relativity constantly in our everyday lives. “If Einstein’s theory of relativity is inaccurate, our GPS systems would not work,” he said. Feldman respects the integrity of the experimental methods used by CERN scientists and says that they did “a very good job.” All data was double checked with at least two different methods of measurement, the margin of error was small, and data analysis was blind. Still, he cannot accept the findings. In lieu of evidence to discredit the experiment, Feldman turned to historical evidence that appears to refute the findings. In 1987, a supern ova exploded millions of miles away, collapsing in on itself, sending particles hurtling through space. Neutrinos arrived on Earth three hours before the light given off by the supernova. The difference in the speed of the neutrinos observed by Grand Sasso’s OPERA detector was greater than the speed of the supernova’s neutrinos. “If OPERA was correct, these neutrinos should have preceded the light by four years,” said Feldman. Feldman explained that these neutrinos essentially had a head start. Because of their negligible mass, neutrinos can pass through matter more easily than protons carrying light. In the case of the supernova, he said, the neutrinos escaped from the center of the explosion faster and began their journey through space first. Feldman pointed out that CERN scientists also had difficulty reconciling their data with the observations from the 1987 supernova. They mentioned it on the first page of their paper. When questioned about where the CERN experiment could have gone wrong, Feldman pointed to technological limitations. He said that 10 billion neutrinos are produced in a few millionths of a second and there is no way to tell when in that period one given neutrino was produced. That may seem like an insignificant amount of time, but when you are talking about a particle no bigger than a millionth of the size of an electron, fractions of nanoseconds matter. This article was first published by New England Post on October 6, 2011. In an industry accustomed to rocky economic waters, this year has been exceptionally treacherous with warming seas and intense competition from out of state fisheries. Holler and the state’s lobstermen hope that the public’s appetite for local products and new recognition from the state will give the industry a needed boost. The Department of Agricultural Resources (DAR) announced at the recent Boston Local Food Festival that it would extend the Commonwealth Quality Program (CQP) to include lobstermen. The CQP is an established designation for local farms, forestry, and aquaculture. The majority of the world’s lobster passes through Massachusetts before being distributed throughout the country by dealers. Massachusetts’s restaurants and markets have access to lobsters from Maine and from foreign fisheries. With no basis for comparison, price wins out. DAR Commissioner Scott Soares said the program could help level the playing field. The CQP seal will tell consumers that not only was the lobster caught by local lobstermen, but also it was caught with sustainable and environmentally sound practices. “Harvesters are seeing a lot of product that come from other countries that are not held to the same environmental standards,” said Soares. Holler said he did not have to alter his harvesting practices in order to qualify for certification. “We have to adhere to strict guidelines to the state anyway, as far as handling egg-bearing lobsters, short lobsters, and how we keep them in the tank,” said Holler. In fact, the DAR sought out Holler and other local lobstermen to find out what best practices were already established, like using ropes that sink to connect traps connected together in a daisy chain to avoid snaring endangered right whales. But will consumers pay a premium for feel-good lobster? Fewer people have been buying lobster at all during the latest economic crunch. Those that have may be looking more closely at price. While Holler doubts certification will boost his prices this year. Massachusetts lobster already sells for premium prices compared to Maine’s. And according to Bob Glenn, an aquatic biologist with the Massachusetts Department of Marine Fisheries, yields in the southern New England fishery may continue to decline as lobsters move north for colder waters. “The southern New England fishery is in a state of collapse,” Glenn said. “Southern New England stock is suffering from a lot of stress that has to do with climate change.” In the last 10 to 20 years, water temperatures have increased, he explains. Water temperatures above 68 degrees affect lobsters’ reproductive cycles, migration patterns, and growth, as well as the overall health of fisheries. So far, it remains unclear whether adding the word “Massachusetts” to those little elastic bands around lobster claws will increase local sales or not. The program is new and many retailers are unfamiliar with it. The Stop & Shop Supermarket Company declined to comment, saying that it did not have enough information to answer any questions.